Man trashes a McDonald's restaurant in Vero Beach, Florida. 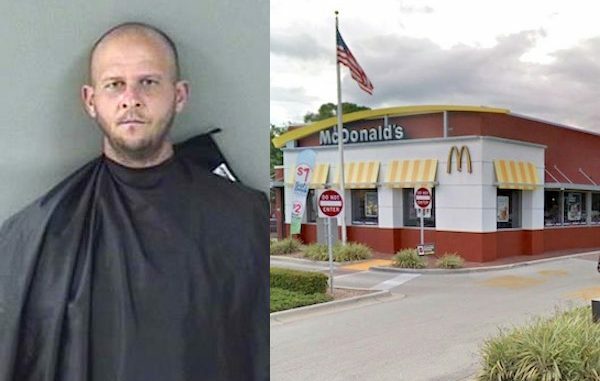 VERO BEACH – A man who made a mess at a McDonald’s restaurant challenges a police officer to a fight once he gets to the jail, according to the report. On Sunday at approximately 9:30 p.m., employees at the McDonald’s, located at 1925 U.S. Highway 1, called police about a man “making a mess in the restaurant,” the report said. Officers arrived and found a man, identified as 34-year-old Benjamin Elias Daum, sleeping in a chair, surrounded by several packets of sauce and food on the floor. Police woke Daum up and asked if he had been drinking after they smelled a strong odor of alcohol. “Yeah, bit**, what the fu** you going to do about it,” Daum asked the officer, according to the report. Police then confirmed that Daum was trespassed from this location a month prior, and arrested for disorderly intoxication. Daum was arrested and charged with trespassing and disorderly intoxication. On the way to Indian River County Jail, Daum challenged police. “I’m going to fu** you up bit**! You just wait until we get to the jail bit**,” Daum said, according to the affidavit. According to jail records, Daum has been arrested a few times this year on alcohol-related charges. In March, Daum was arrested after having an open container in Vero Beach city limits. He was seen drinking with several homeless individuals at a vacant lot, and residents called police about the noise. Additionally, last month, he was arrested after he trashed a 7-Eleven store in Vero Beach.